With caucus Tuesday, March 6 -- one week from tomorrow -- time is running short to pre-register. 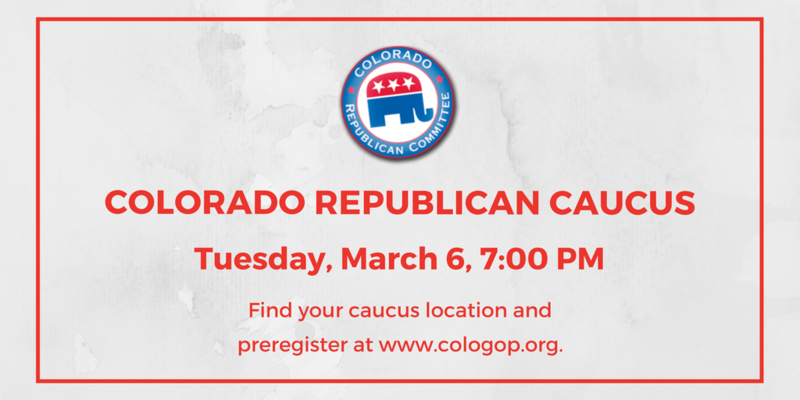 Even if you're not certain you'll attend, take two minutes to pre-register now by clicking here: http://caucus.cologop.org/. It won't cost you a thing and, if you do attend, your pre-registration will facilitate check-in. Questions about how the caucus works? Check out our handy FAQs and answers here. January 8, 2018 - Last date to register with the Republican Party to vote in the March 6th Party Precinct Caucus. March 6, 2018 - March 6th Republican Precinct Caucus. Caucus locations will be added here when known. May 29, 2018 - Last day to affiliate with a party or change affiliation if you wish to vote in the party's primary election. June 26, 2018 - Primary Election. Polls open from 7:00 a.m. to 7:00 p.m.
November 6, 2018 - General Election. Polls open from 7:00 a.m. to 7:00 p.m.